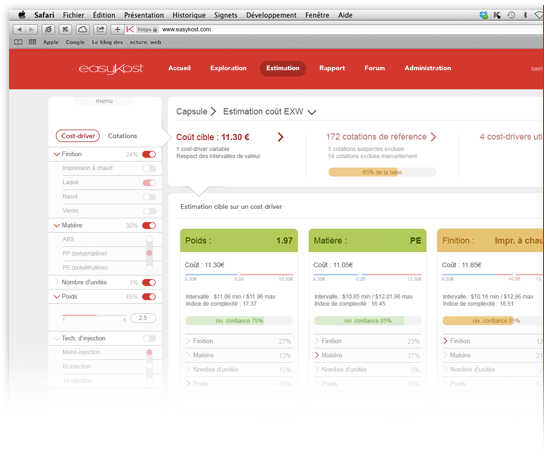 Estimating the cost of a product or service is at the core of the easyKost platform. It is done either via an assistant that guides you step by step to define the family concerned, the cost drivers of your product/service, as well as the range of reference quotations; or via the expert system, which will automatically propose the most appropriate configuration. 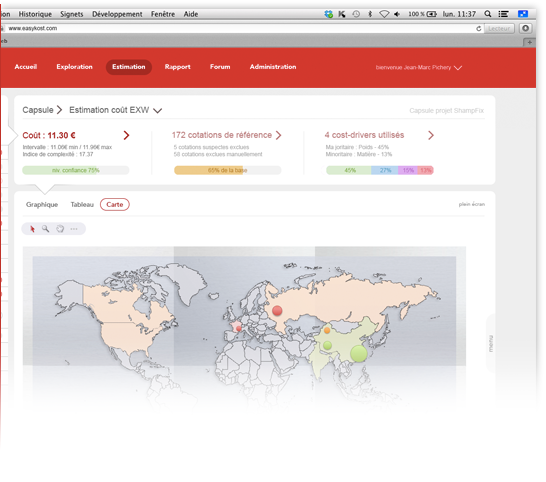 The quotation is estimated instantly and displayed in the form of dynamic dashboards for easy, operational reading. Each parameter of the estimate can then be adjusted. The impact of a change is taken into account immediately, and the estimate is recalculated in real time. You thus know immediately the impact of a modification of your product/service and have all the information necessary to make the right decisions in real time. The easyKost reverse costing expert system also offers you the possibility of defining the cost-drivers of a product/service based on a target cost to be achieved. The results display is graphic, tabular and cartographic. Thus, each representation allows you to adjust your estimate with a clear, precise and adapted reading of each datum. 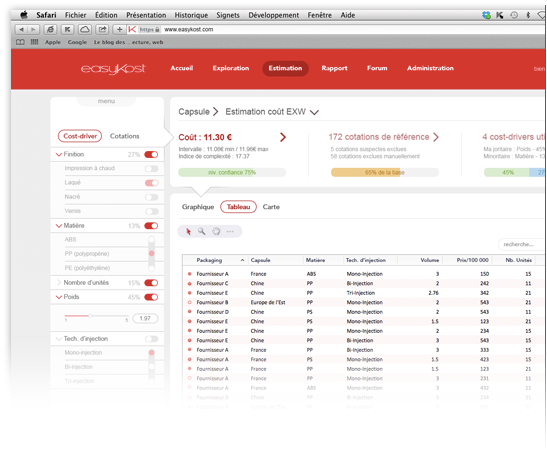 easyKost is not only a cost estimating software; it is also a powerful software for exploring and synthesizing your data. easyKost has integrated data mining functions that allow you to analyze, model and graphically retrieve your information without any special information management expertise. You are finally going to be able to exploit your capitalized data to support your strategies and identify new optimization opportunities. In addition to the standard search, selection and extraction functions, easyKost includes synthesis modules by theme such as supplier profiles, product typologies, etc., as well as automatic segmentations and temporal analyses of your data. This data retrieval is an invaluable asset for your decision making process, but also for increasing your product comprehension. Thus, through these data mining functions, you will be able to strengthen and improve purchasing performance through a better understanding of the cost-drivers, for example. The sharing of information is essential to facilitate exchanges and to make sure that decision-makers have the same level of information to act quickly and effectively. This is why easyKost includes a set of information sharing functions through private or public reports, estimate assumption management with third-party input and validation, but also export functions in different formats and media. It is therefore possible to work in close cooperation and to interact in real time with all of the colleagues of the decision-making chain in optimized, rapid and operational fashion.